Also, according to the USGS, the term comes from the Greek word, lithos, meaning, rock, and the word, sphere, which can be any round object, such as a ball, an orange, or, even, you guessed it, a planet. Wasn’t that helpful? To a Geologist, a scientist who studies the Earth, maybe; but, for us mere mortals, not really. When I think of, “Crust,” I think of the top of a pie. Apple’s my favorite, but anyway, back to the topic. Other times, I think of a loaf of fresh-baked, piping-hot bread, right out of the oven, smothered with honey butter. Oh, it’s so good! Wait a minute! What am I doing? OK, OK, let me make this point so I can forget about food. 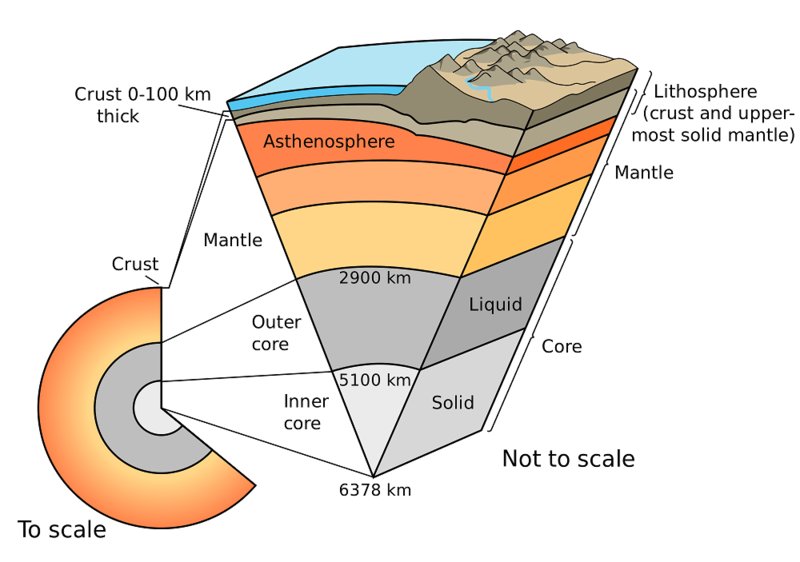 When we discuss, “The Earth’s crust,” we’re talking about the outer layer of the Earth’s surface. This is part of the lithosphere. The crust’s made from 3 different types of rock: Igneous; sedimentary; and, metamorphic. Igneous rock forms when cracks in the Earth, known as fissures, break open or a volcano erupts. Both events bring hot, molten rock, known as magma, to the surface, where it cools and becomes different types of rock; what types may depend upon what else mixes with it, how much pressure it’s under, or how much time passes. The magma, comes from the other part of the lithosphere. It’s released from the upper portion of the mantle. The lithosphere’s responsible for the renewal of the Earth’s surface. When the magma’s released, it becomes known as lava. Other types of rock might be present when the lava arrives; and, since intense heat, pressure, or both can change the rocks from to another, the crust might appear very different afterwords. Some rocks are melted down entirely, and their molten remains may return to the mantle. Eventually, those remains will make another appearance; but, when, or in what form, when all is said and done, who can say? The lithosphere is very important to the rock cycle. Without it, our planet wouldn’t change. I remember the horrible eruption of Mount St. Helens. The devastation, looked like pictures from Japan, after the atomic bombs hit Hiroshima and Nagasaki; but, I recall hearing later that scientists discovered never-before-seen plant life due to the changes the particles underwent from the pressure, high heat, iron content, and their quick ability to adapt. Like our hearts, the lithosphere keeps our Earth young and healthy. Universe Today has some other great articles, if you want to learn more about this or similar subjects. One excellent resource is, Earth, Barely Habitable?. Another is, Interesting Facts About Planet Earth.